← IN CARE at St Leonards NCH (1959 -1962). 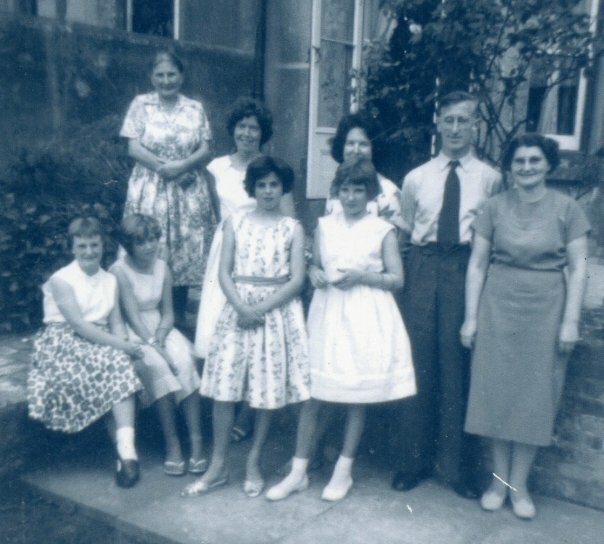 About the time l left the National Children’s Home to live with Auntie Hazel, my foster mum, 1962. Gorilla got my hair! — with Me in front, Linda(my foster father’s niece), Joyce (from NCH. Like me) and Hazel at Canterbury? I went to live with Hazel, her husband Roy and her best friend Jeanne at the end of July 1962. This truly turned my life around…….Joyce from the home went with me at first, it was strange that the NCH should give me another girl from the home to settle me in with, and a bit cruel to send her back once I had found friends of my own. I would think this would be upsetting to Joyce and would explain why we didn’t get on that well. Let me explain….We were both visited and went on holiday with Auntie Hazel, when we were living at the home, so maybe that’s where the animosity came from? I was totally unaware of the situation, until I read it in the notes in my file from the NCH. Joyce must have felt used, and I don’t blame her. Me and Hazel out at the Medway Little Theatre Club. 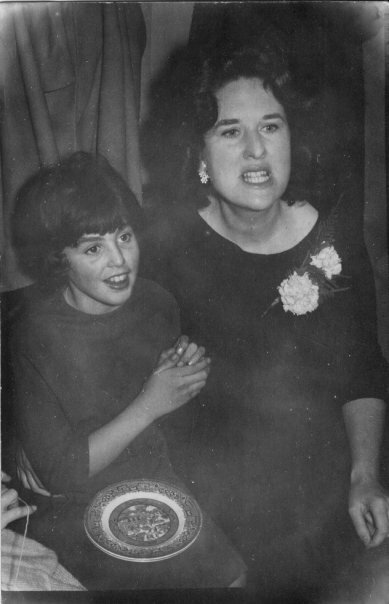 Hazel was a drama queen ha ha!…….No, well, she was a bit, she was an actress and a keen supporter of the dramatic arts and the arts in general and I think this was why we were somehow drawn together. The principle of the Children’s Home felt we were a good match and Hazel saw a little spark of potential in me. I’ve always had a strong creative drive ……whenever I was in trouble or down I would escape to a world that I had control over and a world that I excelled in, it was my thing! and art, drawing, painting, in fact anything even plasticine!!! Anything creative and I’d throw myself into it enthusiastically! I was never excluded and was treated as much like an adult as she could…..I liked this very much. 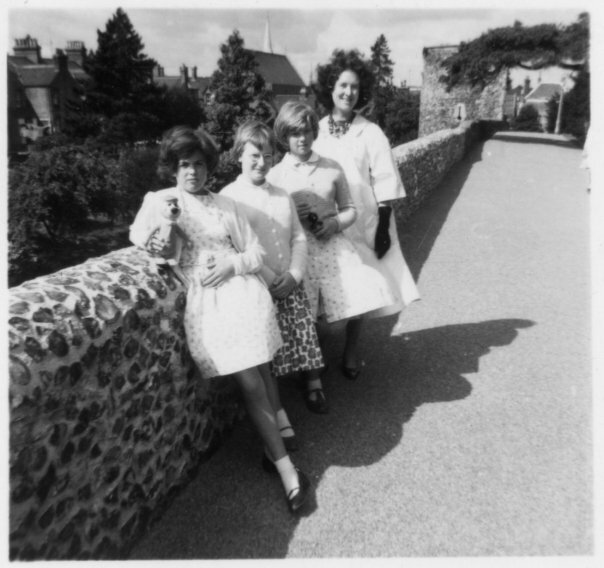 We had great ’60s parties and my favourite drink was Cherry B, none of us knew that this was alcoholic, so after 2 or 3 I was half cut and extremely funny…..I think they thought I was just excited about being out with the adults……I didn’t find out until I was an adult and someone calling Cherry B the ‘Chatham leg opener’……I thought this was hilarious. I will tell you right now, I fell on my feet. I was lucky to have been picked for, or picked by, this foster family. The balance between stimulation and calm security was perfect for me. I was definitely a challenge for these good folks, as l was inexhaustible. They had to take me out for walks like a dog, without the lead though ha! It was pretty much an impossibility to wear me out and it was usually my foster parents that were exhausted , not me, I’d still be up for anything. You might say that was my problem, I could not stay still or quiet, had ants in my pants and boredom would lead me to get up to all sorts, but fundamentally I just wanted to please, so I suppose the analogy comes right back to dogs! Ha Ha, not naughty, just bad at maths !!! 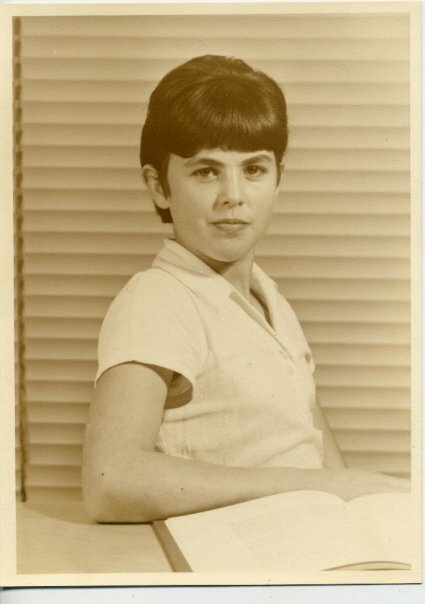 Me at age 11…..The dreaded school photo! A candidate for worst school photo competition! 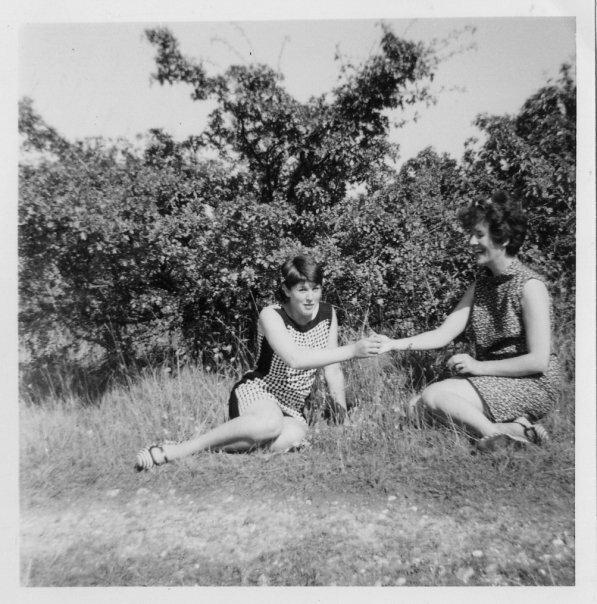 Me (Gilly aged 16) and Hazel, who was to be my mum and best friend for life.. I’m wearing a dress I designed and made……This was the summer before I went to Art College to study Fashion. We shared many interests and were always in each others lives, respectfully, she always accepted me for who l was and guided me to being more and to reach for more on my own terms…..She fought for me, many, many times both as a child and throughout my life. She taught me so much….How l miss her……. Here’s an example from my files……l would have been fourteen. 19.2.1965 Report by Mrs E. Mason, Senior Child Officer………. 31.8.65 Report by Mrs E. Mason, Senior Child Officer………. “Mrs White told me that Gillian had a very controversial report from school. She seems to pit her wits against teacher and earns herself rather a bad reputation. Mrs White is very much on the defensive here as Gillian gives no trouble at all in the foster-home. She is amiable and happy”. At this point I would just like to say a little about my secondary school education……….I really hated it!!! How many of us in care went to Grammar School? I believe not many, well not in my day in the 1950s & ’60s. 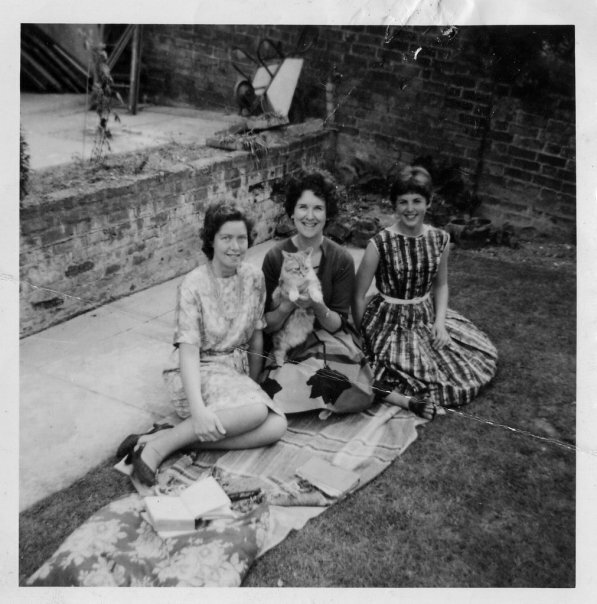 A couple of months ago I got my files from the time I was in the National Children’s Home (1959 – 1962 St Leonards NCH & 1962 – 1970 fostered/boarded out), and much of this information was a complete surprise to me. I didn’t realise that I was above average intelligence, because I never went to Grammar School, so assumed I was not all that, but having discovered from the tests I completed at the age of 10yrs 4mths that I achieved and I quote…. failed all at Superior Adult 1 level. This gives a M.A of 11 years 4 months and an I.Q. of 110. So, not bad eh? I wish someone had told me, it would have given me so much more confidence, I was confident in my artistic abilities, as I had won competitions, but I had the impression that my academic level was at best average and possibly poor and this stayed with me most of my life……This makes me feel deceived, but explains why I had such school reports as……“Gillian pits her wits against the teacher and earns herself a bad reputation”.……….Well that’s because I was smart and in one of the worst secondary schools in the Medway Towns and bored out of my brain, I did next to nothing, I didn’t need to………..I warn all ex members of children’s homes, who haven’t yet got hold of their files of the time they spent in care, hold onto your hats! You will find out things that had you known, could well change your whole life. It’s clear not everybody was on my side. 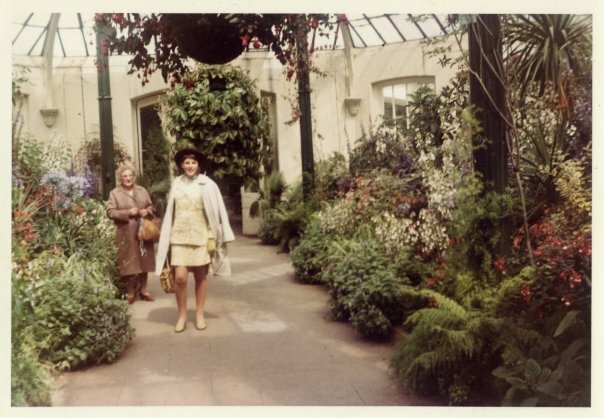 Me out with my foster dad’s mum, Auntie Doris, at Kew garden’s…..I’m wearing a suit I made for my O’level exam…..What’s wrong with that you say?…….I was wearing it out before it was marked! …..Still passed though….Just!! lol ! Check the matching gloves and shoes! I went to get my records from the National Children’s Home now called Action for Children, in Stockwell, London, where I met a nice woman (counsellor) and she went though the more interesting (horrifying!) parts of my records of my time in their care and this is one last stories, showing how much interest or control was kept on my life right up til the day I married…………. Report from Mrs E. Mason, Senior Child Care Officer………. He accepted advice on this aspect most pleasantly. He told me he has a family in Rochester, parents, a brother 17 and a sister 15. His parents approve of Gillian and he thinks, welcomes this marriage because they imagine it may give him stability. He works as a painter and decorator and intends to join a firm who were willing to give him a permanent post although at present he is self employed. He would like Gillian to continue the course at her college for the final year. Gillian listened to this conversation with great interest. She is very pleased to see that in spite of the boy’s appearance l was willing to listen to him and discuss marriage. These two young people are obviously very much in love and l feel that Gillian will benefit from this relationship in spite of appearances. l like this boy and feel she should be helped towards providing for herself the roots that her father was unable to give her. She has written to her father but has had no reply. She intends to marry on June 20th.